Fosjoas V2 Twin-Wheeled Electric Scooter Explains "Concise But Not Simple"
Among Fosjoas electric scooters, Fosjoas V2 self-balancing two wheel electric scooter is one of popular scooters. It realizes the ultimate goal of concise aesthetics, but “concise” here doesn’t mean “simple”. It pays attention to every detail and adopts superb crafts. As a whole, it adopts twin-wheeled design, two round-shaped pedals, removable cushion pads in azure blue and lime green, LED atmosphere lights and high-quality casing. The twin-wheeled design is quite ingenious. It makes Fosjoas V2 twin-wheeled electric scooter stand on itself when it is powered on and also ensures safe and stable riding experience. The upgraded round-shaped pedals that are made from solid and light aviation aluminum material are quite user-friendly. After all, the smooth edge is able to protect your ankles from scrapes. Meanwhile, they also deliver much more comfortable riding experience. The equipped two removable cushion pads are very striking, which have two colors-azure blue and lime green. The installed LED atmosphere lights highlight your riding experience and daily life. They manifest your individuality and also ensure your riding safety, especially in the night. Above all, you can see that Fosjoas V2 twin-wheeled self-balancing scooter focuses on every detail. 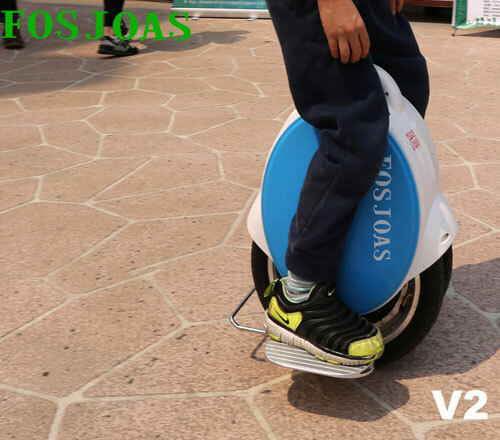 When it comes to applications of Fosjoas V2 self-balancing electric scooter, it is designed for all people. For many young boys and girls, Fosjoas V2 electric scooter is their excellent tool of weaving in high streets and back lanes. For office workers, Fosjoas V2 electric scooter is a great commuting transport. It not only successfully avoids traffic jam, but also saves time by 400%. What is more, the journey to work is also the process of taking exercise. During riding, the four limbs, waits, neck and other parts get exercised. If you ride it to go to work, you don’t need to spend time to take exercise specially. Besides, many old people also would like to choose it as travel transport.